Washington Sep 14 (IANS) Hurricane Florence made landfall on the US East Coast on Friday knocking out power to nearly half a million homes and causing buildings to crumble. Rain and surging seas inundated coastal areas. More than 60 people were rescued from a collapsing hotel in North Carolina overnight. The centre of the storm struck Wrightsville Beach in North Carolina with gales of up to 90mph (150 km/h). Evacuation warnings were in place for 1.7 million people the US media reported. The hurricane was downgraded to a Category 1 storm as it approached North and South Carolina but officials warned it could still kill "a lot of people" amid the risk of "catastrophic" flooding. Roy Cooper the Governor of North Carolina said surviving the storm would be a test of "endurance teamwork common sense and patience". 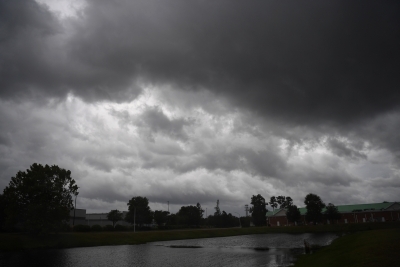 National Weather Service forecaster Brandon Locklear said North Carolina was likely to see eight months of rain in only two to three days. Reports of collapsed roofs and other structures were already reported from North Carolina s Morehead City and New Bern areas the Washington Post reported. A gauge in the city s Neuse River near the town of Oriental indicated the water was 4 feet over flood stage and more than 5 feet above normal levels. More than 1 300 flights along the US East Coast were cancelled through Friday. According to meteorologist Ryan Maue the tropical cyclone was expected to unload 10 trillion gallons of rainfall in North Carolina enough to fill over 15 million Olympic-size swimming pools CNN reported. More than a million people were ordered to leave the coasts of the Carolinas and Virginia with over 12 000 taking refuge in emergency shelters. But not everyone obeyed the warnings. Cheryl Browning who lives with her husband and son in North Carolina said they chose to stay put despite the warnings as they also have three dogs and three parrots. "Either no (hotel) rooms are available or we are denied because of the breed or size of dogs. Many that will accept them only allow one per room. And since we have three dogs and three parrots they re requesting us to take two to six rooms." Several residents told CNN they were not evacuating because emergency shelters won t accept pets. Officials in several states declared a state of emergency including in the Carolinas Georgia Virginia and Maryland where coastal areas were still recovering from summer storms.